Today for #SundaySupper our mission is to make something that can be served on a tray. First thing that came to mind was deviled eggs. I LOVE deviled eggs. There are so many ways you can prepare them and serve them. Last week as you may know I was in Baton Rouge Louisiana, the capital of Cajun food and I can not get enough of it. My trip inspired me for today’s recipe which is Cajun Style Deviled Eggs. These eggs are delish! They have a slight kick of heat from the Cajun seasoning, but not over baring, and to boot they are topped with a piece of shrimp. I love shrimp and Cajun flavors together. These deviled eggs are perfect for serving at your next party. I think it’s a great change-up from the traditional deviled eggs. Let me give you a little tutorial on how to make the perfect hard-boiled egg. You know the one that comes out with yellow yolks and not green. Just add your eggs to a pot, make sure the eggs are not touching and just fill the pot with water to cover the eggs. Bring to a boil, cover and simmer for 15 minutes. Run the pot with the eggs under cold water to stop the eggs from cooking. Let the eggs cool and peel. A friend of mine told me to prevent the shell from sticking to the eggs use older eggs. Don’t buy fresh from the market, but of course don’t use expired eggs. 🙂 It worked like a charm. To make the filling I used the cooked egg yolks, mayonnaise, dijon mustard, white vinegar, cajun seasoning and smoked paprika. Mix it together with a fork until smooth. I placed my filling in a lunch baggie, cut the corner and squeezed the filling into the center of the egg. Perfect! No need for salt and pepper. These eggs are seasoned perfectly. Place eggs in a pot and cover eggs with cold water. Bring to a boil, cover and simmer for 15 minutes. Place pot with eggs in it under cold running water for about 2 minutes. Let the eggs cool completely. Peel the shell off of the eggs and cut the eggs horizontally. In a bowl, add the egg yolks, mayonnaise, mustard, vinegar,cajun seasoning and smoked paprika. Mix until smooth. Taste test it. Spoon the mixture in the egg halves and top with shrimp. I had fun with this recipe and I can’t wait to make them again. I truly love changing up my deviled eggs recipe. Now be sure to check out what recipes the #SundaySupper gang is serving up on a tray today. I can see these disappearing rather quickly at any gathering. I know I’d be all over them. 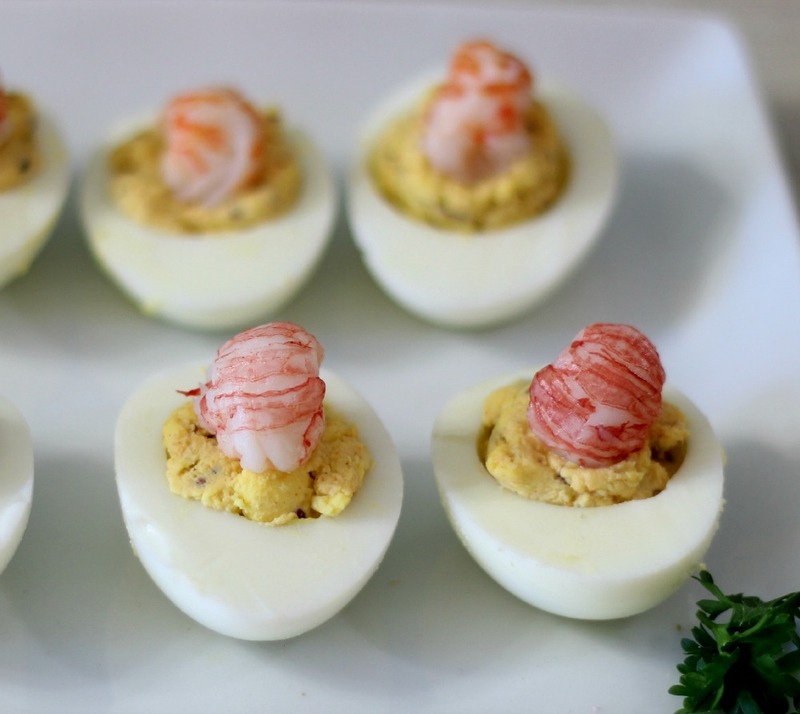 Such terrific flavors in your deviled eggs…and the shrimp garnish makes these irresistible!!! Happy Labor Day! Ahh, thank you Liz! Happy Labor Day to you and your family! Jen: These are the best deviled eggs I have ever seen. I love the cocktail shrimp on top that just finishes off so beautifully. I adore deviled eggs in any way you can make them, but never thought about a Cajun version. Genius!! My husband would love them, I love the cajun flair for sure. I have been on such a cajun kick, such great flavor. how perfect! 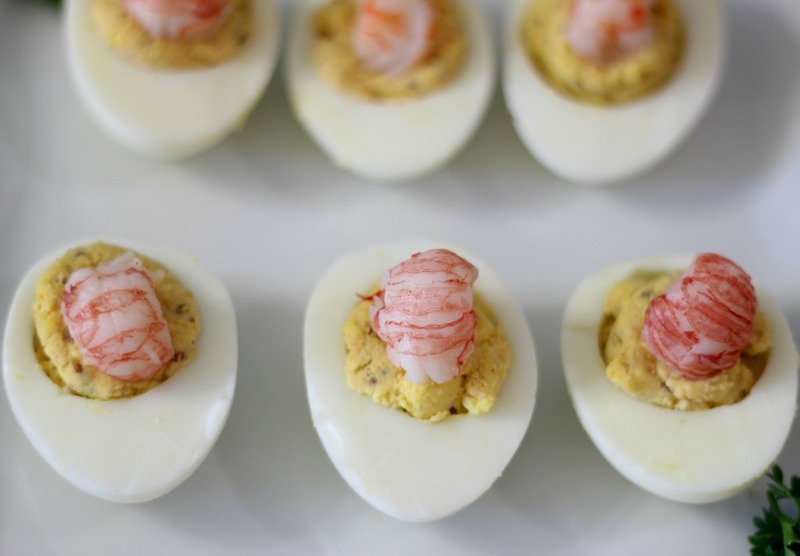 Love non-traditional takes on deviled eggs and absolutely adore the addition of shrimp! Oh YUM! I love deviled eggs and these look so good! Beautiful site you have here, Jennifer. Happy I found it! Thank you so much Kathleen! I will be sure to check out your site. I love the name of your blog. 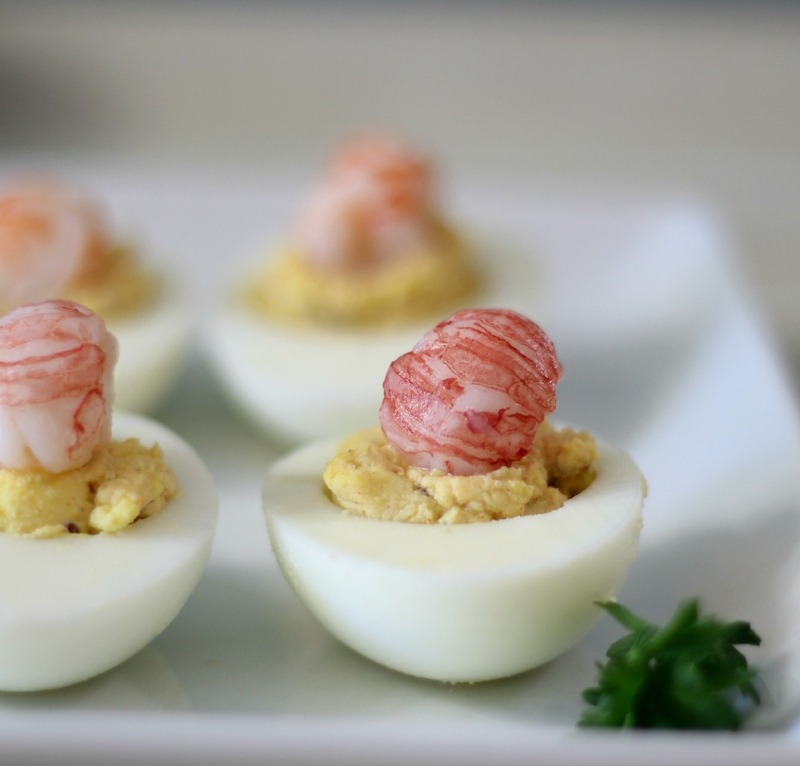 I never thought to use shrimp on deviled eggs. This sounds like a wonderful change up from the plain jane recipe I always use. These would be a huge hit at any party. 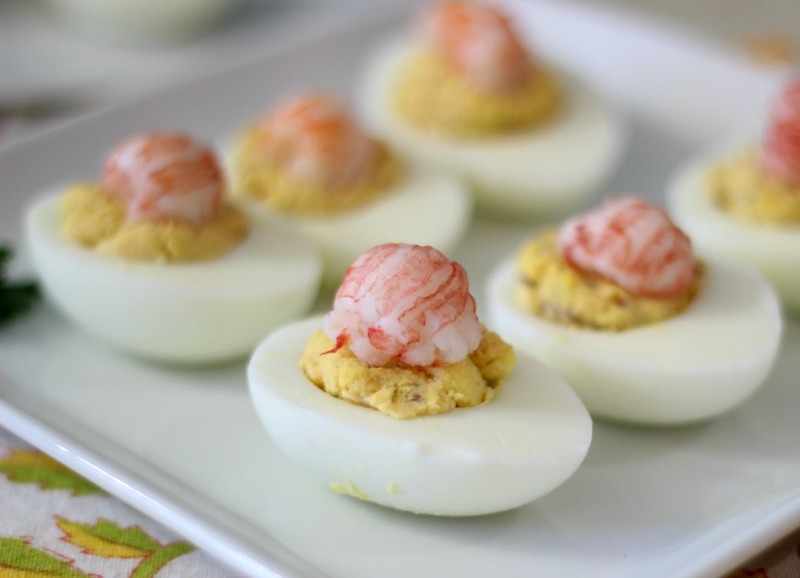 I love deviled eggs too, and love the addition of the shrimp! 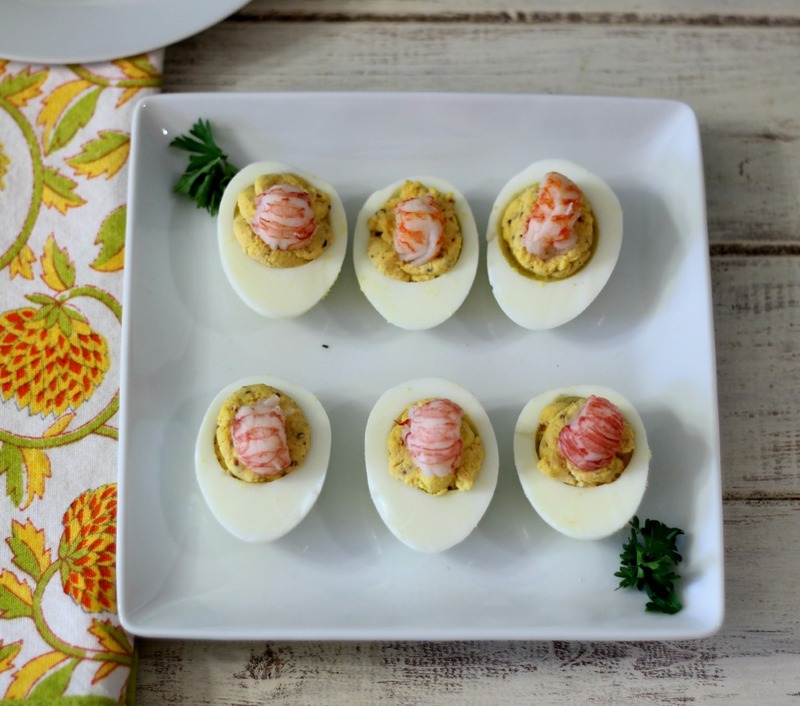 Shrimp sounds wonderful on these deviled eggs!